It’s no secret that Brazil is getting ready to host the World Cup 2014, and its famous night spots are no exception. Known as a party nation, no visit to this lively country would be complete without a few nights spent in some of the world’s best clubs. So, as you prepare to watch the soccer in action, remember to pack your best party clothes for the most stylish venues on offer. This club is like no other. A giant tepee decked out in a Bali theme, Warung Beach Bar can be found in the heart of the jungle along a strip of coastline known as the ‘Ibiza of Brazil’. Catch rapidly rising stars at this venue. They are known to book exclusively house and techno names that are relatively under the radar. It’s one of the reasons they’re regarded as one of the top 20 clubs in the world. 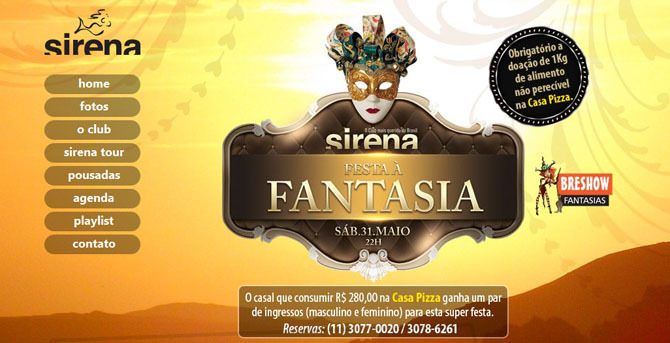 Maresias is a popular weekend getaway from the tourist hub of São Paulo, and the guest list of Sirena’s VIP room is testament to the celebrity status this venue has maintained for more than two decades. The giant dance floor in the main room opens out onto the balcony, whereas the outdoor stage features a dance floor with real trees. No trip to Brazil would be complete without a night’s partying at Green Valley, which has recently been named the top club in the world. Located in the heart of the tropical Santa Catarina forest, this venue has definitely earned its place at the top of any list. The world’s top DJs fly here to mesmerize the always-energetic crowds that create an electric atmosphere. What started out as a lavish restaurant is now a 3000 person capacity club that has earned its spot in the top 25 clubs in the world. This restaurant-club-parking lot has been a big name since its inception more than 15 years ago. No wonder the top DJs have all played there over the past year. If you’re in São Paulo, you need to visit the city’s only underground super-club. Many of the top names in the music industry regard D-Edge as a place like no other. One of the best features is the brand new VIP area that was recently unveiled to lavish compliments. Incredibly, within just over a year from opening, Miroir was ranked in the top 50 clubs worldwide. The unconventional layout features a stack of dance floors, bars and walkways with an unparalleled sound system. Although this club is new to the business, top DJs have already made the journey to experience this phenomenal venue. This 8000-person capacity venue is an up and coming showstopper. The main floor is open-air, giving party goers uninterrupted views of breathtaking sunrises over the surrounding lush forests. From the sound system to the prestigious bookings, Space B Camboriu has it all.